Make an attractive mission style candlestick with free plans. Click here for detailed mission candlestick plans. Even though a candlestick is one of the simplest of the smaller household furnishings, it nevertheless can be made a very attractive feature. For the illustrated mission design, a base, 4 by 4 by 7/8 in., should be provided. This is cut, with the grain, for a 1/2-in.-wide groove, 1/4 in. deep and extending from one side to within 1/2 in. of the opposite side. In this groove is to fit the handle, which is made from a piece of 1/2 by 2 1/4 by 3 3/4-in. stock. It is provided with a finger-grip hole 3/4 by 1 1/4 in. at one end. Its upper edge should be marked off from the center pedestal and fitted to it. The pedestal can be made from stock 1 7/8 by 1 7/8 by 5 in. 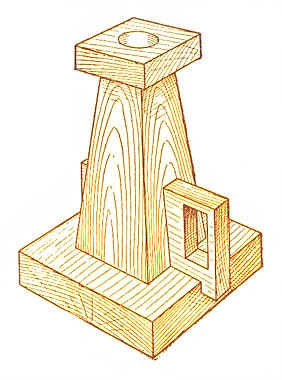 A tenon, 1/4 in. long by 1 1/4 in. square, is formed on the lower end. This tenon is to fit a mortise in the center of the base. A slot 1/2 in. wide is cut centrally in the pedestal, and 2 in. above the lower end, to fit the handle. The upper end of the pedestal is cut straight for 1/4 in. and squared off to 1 1/8 in. This is to serve as a tenon to fit a corresponding mortise in the 1/2 by 2-in. square top. The sides of the pedestal are evenly tapered off from the 1 7/8-in. square base to the lower end of the 1 1/8-in. square tenon, at the top. The parts, before assembling, should be thoroughly sandpapered, as considerable difficulty would otherwise be experienced. No nails or screws need be used, as good glue will keep the parts together equally well. When completely assembled, a hole should be drilled through the top and into the pedestal, to fit the size of candle to be used. A carefully applied mission stain and varnish will give a proper finish to the candlestick.